Should You Be Concerned About the Height of the Market? 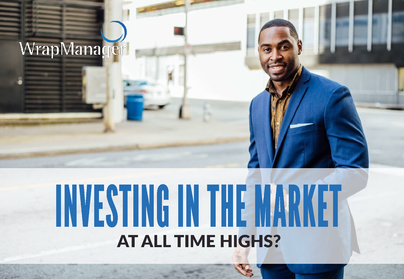 US equity markets have been trading at or near all-time highs recently as the S&P 500 and Nasdaq Composite both reached new highs multiple times in August.1 This news has led some skeptics to believe that a US stock market at a record high level could be a cause for concern. Does reaching an all-time high mean that the market is more likely to decline in the near future? After all, reaching an all-time high means we could be at the peak of the market and we could now be poised for a sell-off. Before we get too caught up in the hype though, let’s take a look back at what market highs have shown historically. Interestingly enough, of these 275 months ending at all-time highs prior to July 2018, 258 of them, or 93.8%, were followed by at least one new month-end all-time high at some point in the next year. 98.2% of all-time highs were followed by at least one new all-time high within the next 5 years and 99.3% of all-time highs were followed by at least one new all-time high within the next 10 years. Historically speaking, more often than not, reaching an all-time high has been a stepping stone to another all-time high rather than a market peak followed by a sell-off. To be clear, an all-time high can certainly be followed by a severe market sell-off. After all, the start of every bear market can eventually be traced back to an all-time high level. That said, market strength, more often than not, has begat more market strength so reaching an all-time high may not be cause for alarm nor should it be interpreted as a signal to sell equities immediately. While you don’t need to wait for equity markets to hit all-time highs to consider rebalancing your portfolio, reaching a record high could be viewed as a good opportunity for a portfolio rebalance. A portfolio that was originally 50% equities and 50% bonds has likely drifted away from these targets as equities have outperformed bonds over the past several years. Resetting the portfolio back to 50% equities and 50% bonds could trim the risk of the portfolio so it is back in line with the original equity and bonds targets. Investors should pay careful attention to any tax considerations of a potential portfolio rebalance in a taxable account. Time to Put Money to Work? Another consequence of equity markets being at record high levels is that investors may be reluctant to add money to their portfolio out of fear that they are too late and they may be better off waiting for a major pullback. More than anything, it may not just feel right to buy something at the highest price that it’s ever traded. Again, more often than not, market high have historically been followed by one or more new market highs within the next year. If you are waiting for a major pullback in the market before deploying additional funds for your portfolio, you may be waiting for quite some time during times of market strength. You run the risk of missing out on fully participating in reaching a brand new all-time high if you refuse to add money to your portfolio simply because the equity market is already at a record high level. Trying to time the market exactly right is typically an exercise in futility and overall this level of loss aversion has potential to derail your best investment goals. Every savvy investor should understand that market sell-offs will happen at some point in the future, there’s simply no avoiding that. The problem with this expectation and understanding is that we don’t know when these periods of equity market weakness will occur. Simply reaching a record high on a stock market index is rarely a sign that a major sell-off is imminent. And acting as though it is can hurt the long-term health of your portfolio by delaying the power of time in market.